Today we officially hit the 40 days to go point! 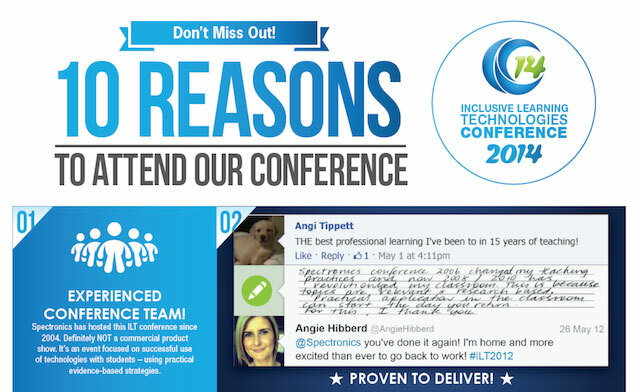 Less than six weeks until the Inclusive Learning Technologies Conference 2014 (ILT2014) kicks off on 20th May on Queensland's Gold Coast! If you have registered already, this update is just keeping you in the loop. AND you should have received an email by now advising you of how to go in and select the sessions you wish to attend. If you haven't received this email just let us know on conference@spectronicsinoz.com or ring the Spectronics office in Brisbane on (07) 3808 6833, or +61 7 3808 6833 if you are calling from outside Australia, and the conference team will be happy to help you out. If you've already dived in and selected your sessions … well done! If you haven't yet registered, there are still places left in all presentations. But some may be closing soon. Of course, the sooner you register, the better your chances will be of locking in ALL of your preferred sessions. With apologies that this is such a long email! This always happens as the conference draws nearer and so much starts coming together for all of our participants. For our enthusiastic delegates, our awesome presenters and our valued exhibitors. Session Selections are now open for you to lock in your personal ILT2014 Conference program! Places still available in all sessions! Yes! Session Selections are now open. How do you go about choosing your own personalised program? It's simple. As soon as you complete your registration, you will be sent an email with instructions (and your own individual password) pointing you to an online page to make your choices. You will be able to revisit that page at any time up until the Thursday before the conference (Thursday 15th May 2014). But … if you don't want to pre-select and just wish to "wing it" onsite for the other three conference days, that will be fine. More of your Keynote Presenters | Today meet The Jasons! If you attended the Inclusive Learning Technologies Conference in 2012, you may remember these two presentations by Jason Carroll and Jason Gibson. If you didn't attend those sessions, you may better remember the overflowing room in which they were presenting the next day! Their Day Two presentations were so popular, that their session on Day Three was standing room only! With many trying to get in, but missing out. So … we HAD to bring both of them back for our ILT2014 Conference delegates. Jason Carroll is an Instructional Technology consultant and a strong advocate for the principles of Universal Design for Learning (UDL). He regularly posts informative posts onto the Texthelp Blog in the USA and shares these posts as a Guest Blogger on the Spectronics Blog. And, as proven at the ILT2012 Conference, is an engaging and entertaining presenter. Learn more about Jason Carroll here. Jason Gibson specialises in learning support interventions based on research-based strategies. Bridging the gap between research and practice for students with disabilities. His experience as a classroom teacher, consultant, and researcher drive his efforts to deliver strategies that not only work, but can also be delivered practically in today’s classroom. He and Jason Carroll regularly share their valuable insights on the Systems of Support blog expressly aimed at "supporting educator excellence through technology and strategy". Learn more about Jason Gibson here. Presentations by the two Jasons in the ILT2014 Conference program include the following. And note, because they have been so popular with delegates selecting their sessions, it looks like we will be filming several of these presentations in full to be offered to people who sign up for our NEW Virtual Registration option. We are certainly working them hard for you! But we are taking them surfing in Byron Bay on the Saturday after the conference as a special reward for all of that effort! So don't feel too sorry for them. The NEW DynaVox T10 to be launched in Australia at the ILT2014 Conference | Gayle Porter onsite to discuss PODD page sets for the T10 too! We are excited to be launching the NEW DynaVox T10 speech generating device in Australia during the ILT2014 Conference. More information about this device, pricing and accessories is now live on the Spectronics website! Charlene Cullen, Speech Pathologist from the Spectronics Consultancy team, will be available to demonstrate the T10 on the Spectronics exhibit throughout the conference, in addition to presenting the following session on the first day. Come along to this session to meet the newest member of the DynaVox speech generating device family, the DynaVox T10. 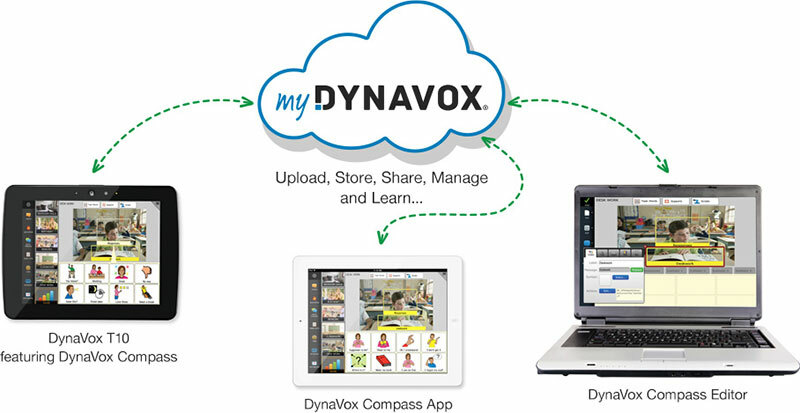 This small, portable, lightweight tablet with Android operating system supports the DynaVox Compass software. The Compass app can also be loaded onto an iPad or Windows 8 tablet. It’s a fully customisable AAC app that uses the Picture Communication Symbols (PCS) we all know and love from other DynaVox devices and the ever-popular Boardmaker software. Also very cool is that Gayle Porter, developer of the Pragmatic Organisation Dynamic Display (PODD) Communication Books, is currently working with the DynaVox team to create PODD page sets that will be available on the DynaVox T10 using DynaVox Compass software with companion iPad, iPad mini, and Windows Tablet apps. To be available as PODD 15, 15+ (expanded functions) and PODD 60 (complex syntax). Gayle will be attending the conference on Thursday 22nd May, and will be available to answer questions about PODD and the page sets being developed for use on the T10 and other mobile devices. Only one more week for you to book discounted Jupiters’ accommodation and free WiFi. Availability can’t be guaranteed after 16th April. Boo! NOTE: We will not be able to guarantee that rooms will be available at this price after next Wednesday 16th April. It will depend on how many rooms remain for the ILT2014 Conference block booking. So, if you are planning on staying onsite, it could be a good idea to whip in now and book using our accommodation booking instructions. Touchscreens for display of the conference program … and more. Because the ILT2014 Conference will be an almost entirely "paperless" event, we have been looking into ways to display the online conference program for you if you don't have access to a mobile device. Or if you just prefer a bigger display and the chance to discuss upcoming session as a group. Many thanks to two of our wonderful exhibitors, Technology Core and IG3 Education, for stepping up to help out by providing interactive LED Touchscreens on mobile stands to give you access to the live program onsite! Oh … we will also be using some of the screens to display our ILT2014 Conference Tweet Wall being set up now by the awesome TweetWall Pro team in Brussels. More about this in our next update!